I’d seen this happen before: old school versus new school, with The School on first, and me imagining that they could not be upstaged, but then to my amazement, on that occasion, at a gig in Cardiff (The School’s and my hometown), in my view, Swansea band, The Pooh Sticks incredibly did put on the better show after all. The School have pretty much stuck to the same style throughout their 3 album career: dreamy tales of love set to the familiar sound of that 60s/C86 pastiche, but they’re one of the few bands that I’m quite content do not need to try any radical new directions. I’ve known Liz since she used to coyly run merchandise desks herself, selling fanzines, badges, all that old school kind of stuff. I think she actually despises me personally, but I can’t help but love her phenomenal song-writing ability. They close with “Let It Slip”, announcing it just after I’d called for it, not actually realising that this is now their regular closing song. So then not too long to wait for headliners, BMX Bandits. In this time, a barman let me know he’d seen Alice Cooper, John Lydon, and even Paul McCartney at this venue, when tickets had been £50, though surely upwards of £200 outside? I must confess, despite obviously being aware of the name, I did not know too much of the music of the BMX Bandits, originating in the 80s. Circa 1990, I had two female penpals from Essex I’d met through an ad in the NME who were obsessed with C86, Sarah Records, Bobby G, all that stuff. Their knowledge of BMX Bandits would surely have been far superior to mine. But I’d been a fan of Teenage Fanclub, so I guess I knew what I’d be letting myself in for to some extent. I suppose from the name alone, I might have guessed there’d be a comic element to their act, as with the Pooh Sticks. I suppose it’s not so much “mocking” of the old scene, but just a different way of embracing it. The band tonight consisted of 3 original, plus mainstay Duglas T Stewart who comes on in cheap looking suit and silly yellow kipper tie. He has the look of ageing Welsh comedian-come-celebrity Boyd Clack about him. He boasted of how they’d driven through snow to reach the venue. He was funny at times, but not on a par with true comedians associated with this kind of scene like Ivor Cutler. There were vague political references. He had his family’s Scottish tartan scarf with him. Not that it’s really relevant, but I still think the Scots missed a trick – yes, they’ve got 56 SNP MPs, but they had the chance of claiming independence handed to them on a plate and they blew it! Curiously, he spoke of The School’s “weaponry”. I don’t think he was referring to anything like Welsh nationalists burning down English cottages years ago. 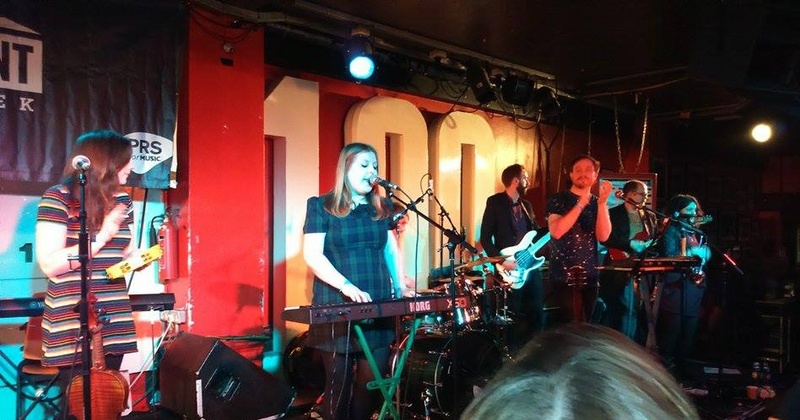 The School’s weaponry is about, in fact, being more old school even than the BMX Bandits themselves – shuffle off the stage you old timers; highlight stealers! Heh, no offence meant really – I know it’s a bit rude as they’re celebrating their 30 year anniversary – some achievement, of course. The seven piece band (there was a trend in Cardiff for bands with large numbers for a while) come across as shy and reticent, but that is The School’s power. They’re one of the few bands around now to still truly stick to original roots with a good degree of humility. I like the way The School keep their imagery local, with record sleeves depicting Cardiff landmarks. That’s not to say they haven’t toured extensively, including right across America and Europe, and no doubt they have loads of contacts, and I still say they’d look great on Jools Holland and on covers of magazines, and they could have packed venues of people dancing and singing along. But for now at least, I think they still just like to see the shoulder shufflers, the few people mumbling the odd few lyrics they remember. BMX Bandits got big applause for the likes of their most well known songs – “Serious Drugs”, of course – but enjoyable, even moving as their show was at times, this time, I’m giving the vote to The School.